This is a quick dish that can be scaled down to a few or make a lot for a crowd! Don’t be afraid of making clams, I will walk you through the selection of clams and preparation. This is the time to try them, you will have control over the quality as opposed to eating them out at a restaurant. See “Chatty Advice” below before purchasing your clams and preparing the dish. In a small pan melt butter and sauté garlic over low heat. Set aside. In a medium size pot, on medium high heat, add the white wine and the clams and cover. Watch closely because the wine may bubble up and you will need to reduce the heat. Cook until all clams are opened. Pour clams into a strainer and cover with a cup of ice to help them quickly cool. Remove the clams from shell, and set aside. Twist the shells to create two individual shells and discard one shell. The one that remains will be your serving dish for the appetizer. Rinse shells to make sure no shell or residue is stuck in the dish. Place the best of the 15 shells on a cookie sheet. 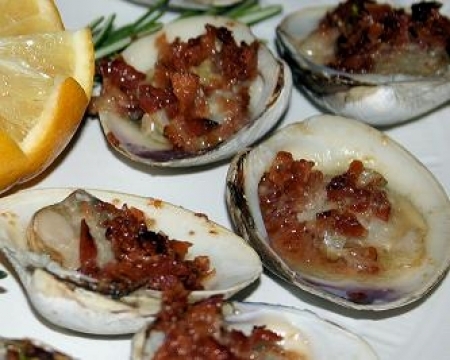 Add the clams, and evenly spread the bacon over all 15 clams. Drizzle each clam shell with garlic butter mixture. Place on the middle rack of an oven and broil on high until bubbling. Usually less then 5 minutes. Serve immediately. Try Martin Ray Chardonnay (Russian River Valley), Hahn Estates Chardonnay (California) or Rodney Strong Chardonnay (California). Clams must be kept alive until they are cooked. So do not suffocate them in a plastic bag or drown them by soaking them in water. As soon as coming home from the grocery store, empty the bag of clams into your sink. Thoroughly but quickly rinse all of the clams. Then let them drain, put into an uncovered baking dish and refrigerate until ready to cook them. When rinsing the clams, any with cracked shells should be discarded. If you find any that will not close when handled, discard them as well, because they are dead. They will open to breathe but once touched or are moved around they should close. If in doubt smell them. They will probably have a bad odor if they are dead. When clams are cooked they should open. If some clams did not open after cooking them, discard them. However, if half did not open they may not have been cooked long enough. Keep in mind that clams take about a minute or two longer to cook than mussels.